This year has undoubtedly been a strong one for new anime but the summer 2016 season has seen perhaps some of the biggest shows. One of those shows is Re:Zero, which I’m here to review. You may remember that I also reviewed the first volume of the Re:Zero light novel series, which the anime is based on, so if you’re interested you can find that here. Re:Zero tells the story of Subaru Natsuki, an ordinary teenager who is suddenly summoned to a fantasy world. Once Subaru recovers from the surprise of being in a new world he is saved from some muggers by a pretty young women named Emilia (who originally introduces herself as Satella), but little does Subaru know that his destiny will be tied to hers. When Subaru first meets Emilia, she informs our hero that she’s looking for something that’s been stolen from her, and in order to repay his debt to her, Subaru agrees to help in the search. Eventually the two discover where the thief is trying to sell off Emilia’s item, but when they get there, they discover two dead bodies. It’s not long before the killer, who was hiding in wait, also attacks and murders Subaru and Emilia. 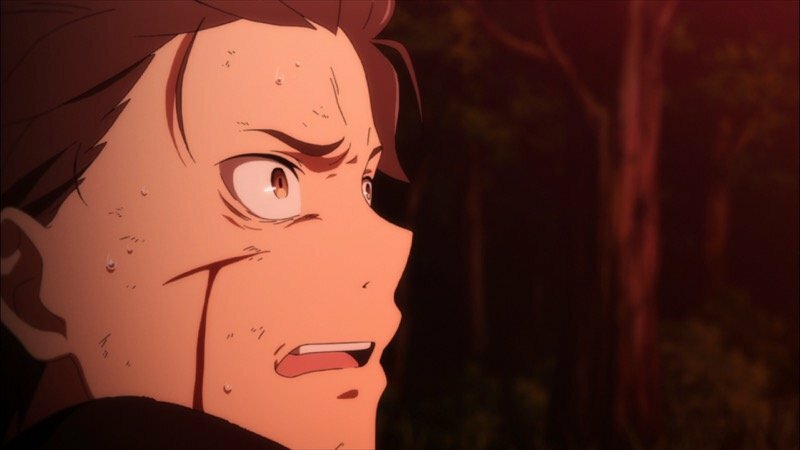 Usually when a main character dies that signifies the end of an arc or perhaps even the end of a series, but in Re:Zero’s case Subaru awakens perfectly fine – just right back at the moment where he was first transported to this world. As our story progresses Subaru discovers that he has a special ability, which he calls ‘Return by Death’, that allows him to rewind time by dying. It appears that Subaru’s return point changes for every arc and almost always after he’s ensured the safety of Emilia. This life-and-death circle is an interesting one because, although it means we sometimes relive the same story loop numerous times, more often than not the scenario plays out differently. What’s more, with each do-over Subaru experiences, he gains new insights of what needs to be done. 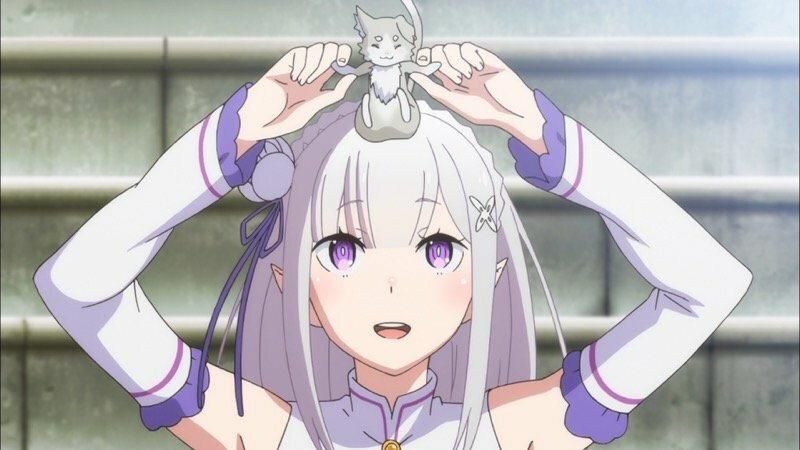 Sometimes things will get worse, sometimes things will be better, but each time the mystery of why Emilia (or other members of the cast) are being killed off slowly unfolds until Subaru finally manages to break the cycle. It’s a really interesting gimmick to watch and even after 25 episodes the series has managed to find ways to keep things fresh. 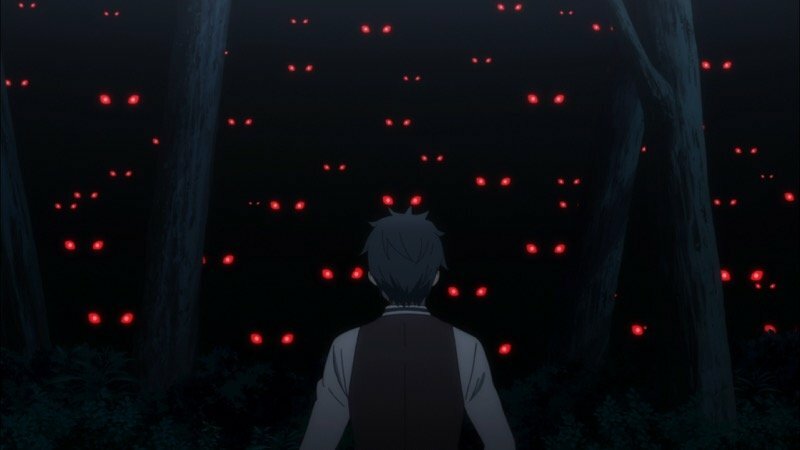 It’s very difficult to talk about Re:Zero without spoiling the plot because this is a series that I feel really doesn’t hold up if you know what’s going to happen. Much of its charm is in wondering how Subaru is going to prevent the current problem and being on the edge of your seat from week to week as we’re delivered the latest cliffhanger. I’m not entirely sure that the show would be as enjoyable on a second watch either, as knowing what’s coming will leave you focusing on the numerous problems that Re:Zero is home to. A problem many light novel adaptations suffer from is when an animation studio adds their own content in among what they’re adapting. I think studio White Fox have done an excellent job with Re:Zero (more on this later), but they’ve also created some inconsistencies by either taking out pieces of the novels or bridging together certain points with their own content. My best example comes thanks to Puck, Emilia’s spirit familiar who directly introduces himself to Subaru in the initial loops and vice versa for the first arc but not during the final loop. In this section there is a scene where Puck says Subaru’s name, almost as though he’s fully aware of who Subaru is, but as the two of them never introduced themselves in this loop it’s not possible for Puck to know Subaru’s name. It’s not really a big problem, but if you were watching the series for a second time and not as focused on the unfolding drama I think these inconsistencies would stand out more prominently. If you’ve been keeping up with the anime on social media, or even discussions on this very site, you’ll probably have noticed that people usually aren’t fans of Subaru. Generally speaking, Subaru is just not a character who was made to be likable. He’s not your run-of-the-mill shonen protagonist, he’s hopeless, and frequently runs his mouth, but in a way that actually makes him more likable to me. It’s difficult to like Subaru when he simply appears to be protecting Emilia because he fancies her, and his tendency to say every little thing that crosses his mind leaves him sounding obnoxious. However, as much as we viewers are learning about this world and the cast, so too is Subaru. When he finally begins to put the effort into finding his place in the world, he comes off a lot better for it. It might have taken me the best part of half the series but eventually Subaru did become likable, and by the end I found myself rooting for him to save the day. Where other characters are concerned, things were pretty good overall. Emilia, who is quiet and very reserved, finds it difficult to interact with people, due to being shunned for resembling the white witch (an unspoken evil in this world). As she slowly opens up to Subaru, and as we see more of her and Puck, it’s clear that they’re both strong characters who always shine when they’re on-screen. There is also the case of Rem and Ram, two maids who work for man named Roswaal (the owner of the mansion that Emilia calls home) and are definitely fan favorites. The two may not seem like the most interesting of characters to begin with, but we come to see their true depth once we’ve had the chance to spend more time exploring their story. All round, it’s a pretty good cast and there weren’t any characters that I outright hated. I’ve only focused on a brief portion of them, simply because to talk about the others would result in spoilers. Animation studio White Fox (they also worked on Akame ga Kill! and Steins;Gate) have done a marvelous job where Re:Zero’s animation is concerned. For a fantasy setting such as this, White Fox have provided some very colourful settings and characters but they’ve also mastered the darker and more soul-crushing scenes as well. To their credit they’ve also managed to make a decent use of CGI for some of the busy town scenes where other studios may have used it more clumsily. Music for the series has been provided by Kenichiro Suehiro, who is a bit of a newcomer when it comes to handling anime soundtracks. His most notable work besides Re:Zero is Space Patrol Luluco, but considering how light-hearted that series is (and the fact it’s made up of 7-8 minute shorts) it’s safe to say that Re:Zero is more his breakout work. The soundtrack provided for the series is quite good and home to both electric produced tracks and more basic piano scores. 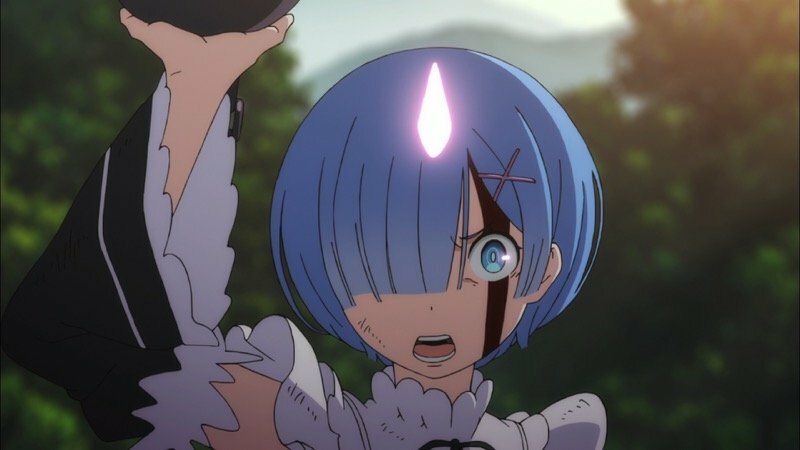 It’s a mishmash of a few different genres of music but that works surprisingly well for a series like Re:Zero as it keeps the content fresh and with an edge of surprise. The opening themes (“Redo” by Konomi Suzuki and “Paradisus-Paradoxum” by MYTH&ROID) and endings (“STYX HElIX” by MYTH&ROID and “Stay Alive” by Rie Takahashi) are all very solid pop tunes and work exceptionally well for the series. That said, it’s not actually that often we get to watch the openings and endings because White Fox tends to leave them out in favour of adding more time to each episode! Like the music and animation, the voice actors on offer have also done a wonderful job, especially Yusuke Kobayashi (Daisuke Hiraoka in Shirobako, Zenji Marui in Food Wars) who plays Subaru. Subaru goes through a lot of emotional whiplash throughout the series and his moods and tone of character change drastically over the course of the story, but Kobayashi manages to capture these transitions perfectly. This performance leaves me eager to see how he’ll play future roles. Rie Takahashi (Miki Naoki in School-Live!, Megumin in KonoSuba) provides a good performance for Emilia, capturing her quiet nature and shy profile rather well – although it’s not quite as good as Kobayashi’s. I will also take a moment to point out that Yoshitsugu Matsuoka (Kirito in Sword Art Online, Soma in Food Wars), a personal favourite of mine, also voices a character in the series but not until later on. It’s a delightful performance and quite different from his norm, which makes for an interesting performance. 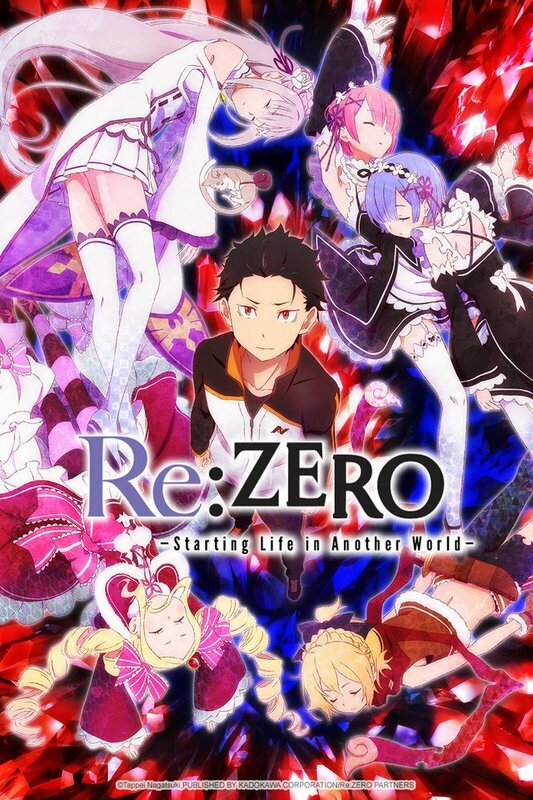 Overall, I recommend Re:Zero to everyone as it breaks the trope of the ‘being transported to another world’ genre and offers something new. If you can look past Subaru’s annoying personality for a few episodes then you’ll be fine, and even if you can’t, you’ll probably be too busy being amazed by the latest cliffhanger to really care. There are little things to look past, but provided you can this is a solid series. Perhaps it’s not the best anime of 2016 and maybe we won’t even remember it in a year’s time, but for now, it’s one of my favourites of the year for sure. The Re:Zero anime can be streamed over at Crunchyroll and Anime Limited have licensed the series for a future home video release.